Team Sotong (Winner): Summer, Craig, Saman, Arun, and Daniel. The team-building activities and games were well organised and thoroughly planned. We have many reliable guides to great authentic Malacca food and Peranakan cuisine. 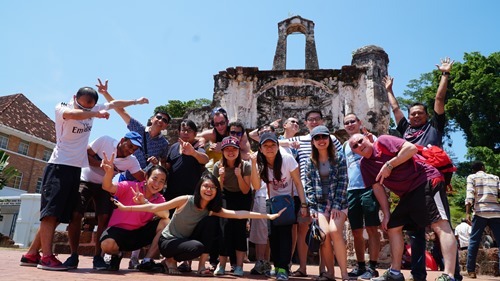 The activities were cleverly infused with intellectual tasks of learning about Malacca’s heritage by exploring the historical sites such as Stadthuys, Christ Church, A Famosa, Jonker’s Street, and more. On the first day, the first game was bowling in an alley at a shopping mall near the hotel. Team Sotong won with a smashing 532 points. Coincidentally, the individual player with the highest score of 135, Saman, our regional sales manager, was also from Team Sotong. It was a boisterous and fun-filled bowling session of discovering bowling talents within our own teams! Next, we headed to the Padang, a huge windy velvety grass field where people come to unwind and relax. The second game of Drawing – a test of everyone’s drawing skills – took place with shrieking laughter and amused faces. Team Sotong and Team HEFE Reloaded came to a tie of 300 each. The first day ended with a delectable dinner of peranakan cuisine at Hotel Mimosa. After that, each team took off to complete a photo-taking task around the historical sites. The second day commenced with an uproarious and entertaining game of Charades which brought great guffaw to everyone. It was not a surprise that Team Sotong won again with the highest score of 200. Everyone headed back to the hotel’s meeting room where we had our corporate retreat session and our Inaugural Innovation Day which provided everyone a time to reflect what improvements they have done in both individual and department levels. The corporate retreat ended with a fun quiz. Dinner that evening was delicious seafood at a famous family-owned restaurant called Restoran Tong Sheng. After everyone ate till their heart’s content, we headed to our karaoke session for an entertaining night of belting out old school songs and having a mini bachelor’s party for one of our lecturers who will be getting hitched very soon. Mr Clarence, a singing enthusiast with a crooning voice, sang a handful of songs which got the ball rolling in the KTV room. On the last day, some of us went to a nearby coffee-shop for traditional Malacca breakfast/brunch specialty; Mee Kahwin (a delightful combination of Mee Rebus and Rojak), Mee Rebus, toasted bread with kaya and butter, half-boiled eggs, and kopi (coffee). Everyone wandered around the shopping malls for a while before checking out and heading back to Singapore together. On the way back at a rest stop, we celebrated the birthday of Fred and Daniel with a cheesecake. Albeit a short getaway, this corporate retreat was fun, engaging, and effective in bonding the whole SDH team together, as well as energizing everyone and encouraging cross-departmental interaction. 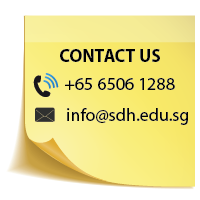 To view the photos, you can go to our SDH facebook.